Free speech is the most important right we have. The Founding Fathers, understanding it as the prime element in a free society, wrote it into several amendments of the Constitution. The First Amendment guarantees it as a right in terms of individual and collective speech on civil and religious matters, whether by personal expression, public assembly, or private worship. 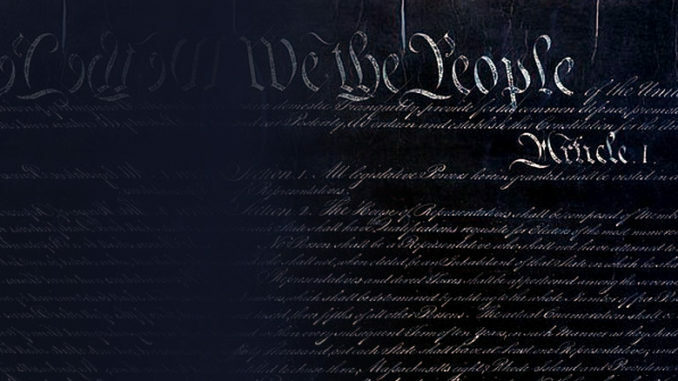 The Fourth Amendment protected the means behind free speech in the security of books, papers, and other materials from seizure or scrutiny except on the basis of a probable cause warrant. The Fifth Amendment guaranteed the no less crucial obverse of free speech, the right not to speak where self-incrimination could result. Finally—and crucially linked to the Fourth Amendment—the institution of a free press was recognized, as the means by which the public dissemination of information critical to informed speech and judgment was based. Free speech is also linked to another critical element of democratic value, tolerance. Free speech is challenging by its nature, and sometimes disruptive, offensive, or shocking in its effect. It is also open to abuse, the proper corrective to which—libel laws apart—is more free speech. It’s a good thing you can’t get too much of, most especially when it’s used in a bad way. You don’t have a right to shut people up, but you do have the right to tell them they should do exactly that. And both of these things are as they should be. Free speech is not only an exercise, but a climate. “Pass the salt” isn’t free speech in the sense that “impeach the president” is, but the confidence we feel in speaking our minds or communicating our needs rests generally on the assumption that we need not fear for ourselves in doing so. The confidence we may have in expressing ourselves is the basis of our social dignity and therefore of our citizenship. It isn’t without limits, but those limits are just what free speech itself negotiates every day. We know that one day without it, and we cease to be a free people. There is a cost for free speech, however. That cost is not simply that we may be exposed to speech that is careless, irresponsible, or vindictive. It is that certain speech is knowingly false or distorted. The name for such speech is propaganda. When such speech is the only speech allowed, then you know you are living in an autocracy. But propaganda is a hazard of free societies, too. How do we know when we are being exposed to propaganda? It comes at us every day in many forms: from the government, from lobbyists, from commercial enterprises, from so-called special interests, and from the think tanks that think in only one way. There is one common denominator behind all forms of propaganda, however: the driving force behind them is not thought, but money. It’s not wrong per se to be paid to speak. Academics and ministers of the cloth are paid to do just that, but it is their expertise (which of course includes questions of judgment and value) that is being hired, not their personal opinion. Some cases are more clouded. When Hillary Clinton received $675,000 for three speeches to the investment firm of Goldman Sachs, and when Barack Obama will—unless his better judgment prevails—receive $400,000, a sum equivalent to his presidential salary, to deliver a single speech to the same firm, we may well suspect that their listeners are not paying them to tell them things they don’t want to hear. Clinton faced much pressure to release the text of her talks during her campaign for president, which she successfully resisted. The point, though, wasn’t so much the content of her remarks as the context of her making them. Goldman Sachs was a notorious bad actor in the scandals that led up to the financial crash of 2008, and its modus operandi appears little changed today. What it was and is buying from both Clinton and Obama is respectability, or in plainer terms whitewash. Nobody needs to tell either speaker what to say. And, if in neither case is it exactly propaganda, neither is it free speech. It’s words for dollars. This brings us to the currently vexed issue of free speech on campus. Outside speakers are routinely invited to address student organizations, many of which have political orientations. They’re often paid expenses and honoraria. Their expertise is sometimes expected, but it is always assumed that they will express their opinions, which is to say that they will speak freely. Recently, some conservative speakers have aroused passionate opposition from other campus groups, with a bit of scuffling involved: Charles Murray at Middlebury College, Ann Coulter at Berkeley, and in the case of Milo Yiannopoulos, also at Berkeley, a fair-sized riot. These three celebrities of the Right, as I suppose we can call them, are distinct cases. Murray is an academic, best known for his argument in The Bell Curve that the poor are essentially stupider and the rich essentially smarter, a claim recently put forward more crudely by Donald Trump’s Secretary for Housing and Urban Development, the inimitable Ben Carson. Coulter is a political entertainer who specializes in bashing the Left; she has a shtick and she delivers it with verve, which gets her the occasional television appearance. Yiannopoulos is a provocateur who’ll say or do pretty much anything to get noticed; his racism and misogyny are deliberately unfiltered, and he’s managed the feat of getting himself banned both by Twitter and Breitbart News. I think it would be fair to call him the alt-Right’s poster child for hate speech, except that he uses it not to express actual views but to peddle his wares. He makes a living, in short, from hate. Is it right to ban any or all of these personalities from campus, or to try to bar their audiences from hearing them? Ideally, free speech should reflect conviction or conscience, but that is not a requirement one can impose on it. Personally, I think the term “hate speech” is a form of censorship, and that the category of hate crimes is an abuse of the law. This doesn’t mean tolerating things one finds hateful, but combating them with speech of one’s own, and punishing violations of the law but not the presumed motivations behind them. To criminalize thought, however objectionable one may find it, is to destroy freedom at its root. The problem I have with the current controversy over “conservative” speakers on campus is not with their views, when they actually hold them, but in who is paying to promote them. As investigative reports have revealed, some campus groups are or have permitted themselves to be turned into front organizations for alt-Right agendas surreptitiously funded by outside parties, in no small part not for the purpose of fostering debate but of sowing disruption. That’s propaganda with a particularly nasty objective: to undermine the university itself as a place where genuine free speech and civilized discourse is possible, and with it the education for citizenship that is part of its essential function. It is of a piece with the debunking of the free press as a mere site of “fake news,” i.e., propaganda, which emanates now from the office of the presidency itself. In the alt-Right world, there is a small, embattled core of truth-tellers, surrounded by a vast liberal conspiracy designed to undermine American values and deliver the country to its enemies. This isn’t conservatism in any honorable sense; it’s the paranoid fantasies of fringe racist and nationalist groups being fanned to camouflage the tightening grip of a moneyed elite. And it isn’t merely liberal editorialists who are appalled by this development and by the authoritarian bully it has helped to propel into the White House, but conservative commentators such as George Will, Charles Krauthammer, and William Kristol. To be sure, there is plenty to criticize in our institutions, including universities and the press. But they are what we have, and where the hope of freedom lies. The aim of those who are trying to trash or pervert them is not to make them work better but to bend them to the interests of a few, to crush critical thinking and independent judgment, and to reduce diversity to subservience. So: listen all you want to Charles Murray or Ann Coulter or Milo Yiannopoulos, if that’s your pleasure. They have a right to speak, or as in the case of Yiannopoulos to abuse speech. But college campuses have no obligation as such to host them, and if student organizations are going to accept subventions from outside donors to sponsor propaganda events, let them register as lobbyists so that all cards are on the table. Free speech is what comes from the heart and the mind, not from someone else’s pocket. Let’s be very, very clear about the difference.